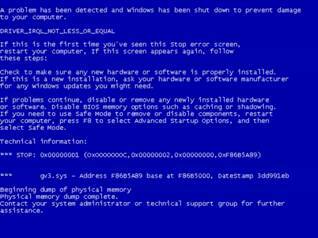 BSOD – Blue Screen Of Death. Colloquial name for the display usually seen When Windows cannot continue. Drivers – a Device driver interfaces between Windows and the hardware component it was written for. Registry – An in-memory structure of parameters necessary for Windows and other programs. Loaded from six files held on disk. Reformat – To wipe all data off the disk drive and prepare it for a new installation. All programs and data are lost. These are faults that prevent Windows from running even though the monitor display is able to show some text. They arise because the computer is not able to read one or more files that are essential for it to function. The text can differ but the overall image is like that above. Sometimes this screen is only visible for less than a second before the machine automatically restarts in an infinite loop. Other times there is a short message on a dark background similar to “The registry cannot load the hive… It is corrupt, absent or not writeable”. Other manifestations include computers that hang such that the only option is to power off abruptly – thereby possibly exacerbating the problem. Hardware failure. The disk drive contains moving parts and like all such items (washing machines, vacuum cleaners etc.) has a finite lifespan. This can be lessened by a poor quality electrical supply, sub-standard manufacture, poor environmental conditions (hot, moist or dusty perhaps) or physical shocks such as jolting it. An electrical disturbance. If there is no surge protector in full working order or uninterruptable power supply, a brownout, sag, spike or surge may have disrupted the disk controller circuitry. Virus action. Even the best anti-virus products are less than 100% effective and some viruses are silent while they are accomplishing their mission. Configuration changes. These can be caused by tinkering with some settings or perhaps a badly written program that does more than it is expected to. Disk structure corruptions. This relates to the logical structure of the disk and the definition of its geometry. Magnetic interference or physical disturbance can cause this. First, the hardware components have to be tested and either found not to be at fault or replaced (a repair is occasionally possible but inadvisable). After this, one or more software faults remain and a common remedy, particularly practiced by large impersonal organizations, is to clear all faults at one go by reformatting the disk and installing Windows from scratch. This has the advantage of offering a guaranteed resolution, but all programs and device drivers have to be reinstalled as well as any data recovered from backup copies. Some people do not have up-to-date backup copies of their documents, photos and music and so significant extra expense must be incurred attempting to have these recovered from a failed disk drive. An alternate although less lucrative approach practiced by 1ComputerCare is, after establishing that all hardware components are functioning normally, to repair each fault that can be found individually. The difficulty with this approach is that it is not possible to know which files, nor how many, have been damaged. So all common programs must be tested for long enough to establish whether they are functioning properly. If they are not, each has to be repaired individually. If the total damage is too great, Windows can still be reinstalled later. The advantage of this approach is that no backup copies of favorite files, e-mails or settings have to be relied upon, no programs need to be found on CD or downloaded before being installed, and no product keys need be found to enable product activation. It should be understood that it is impossible to know which files have been damaged without trying to use them, and therefore all commonly used programs have to be run to try and locate problems. Because of the infinite combination of factors influencing the environment a program is run in, all programs must be tested in the common contexts in which they are usually run. Moreover, for privacy reasons e-mail programs are seldom tested. Therefore it is not possible to guarantee that all possible combinations of programmatic environments will execute without an error, so occasionally faults remain after a computer is returned as being fixed. Once a computer is returned, it should be thoroughly tested by the owner, as any faults found within the first week should be covered under the repairer’s guarantee. By following the steps outlined at http://www.1computercare.co.uk/housekeeping.htm and in particular, maintaining complete verified backup copies of important files, repair work can be kept to a minimum. Computers bought off-the-shelf usually come with ‘recovery’ disks that are not as easy (sometimes impossible) to use for Windows recovery as the complete Microsoft produced disks that come with custom built computers. Once a problem has been detected, DO NOT try to repair by running the manufacturer’s ‘recovery’ disk before any required files are salvaged from the seemingly broken disk drive. Simply switching the PC on causes disk activity that can significantly reduce the prospects of saving documents and photos. Make sure that your copy of Windows is legitimately licensed and activated. This can be confirmed by visiting http://www.microsoft.com/Genuine/ There should be a Microsoft produced Certificate of Authenticity stuck on the PC case that contains a valid product key that will be necessary to enable reactivation.